So after two wins, I found myself on table 2, against a familiar army: those of you who have been following these battle reports will remember Yann’s @Shizuu UD from the last game of the Challenge, where he beat me after a very exciting game! This time around he had changed his list, mainly motivated by modelling reasons: having completed two Winged Reapers, he managed to get them in the list! Thankfully for me, that required sacrificing the Divination master wizard, much to my dragon’s relief! 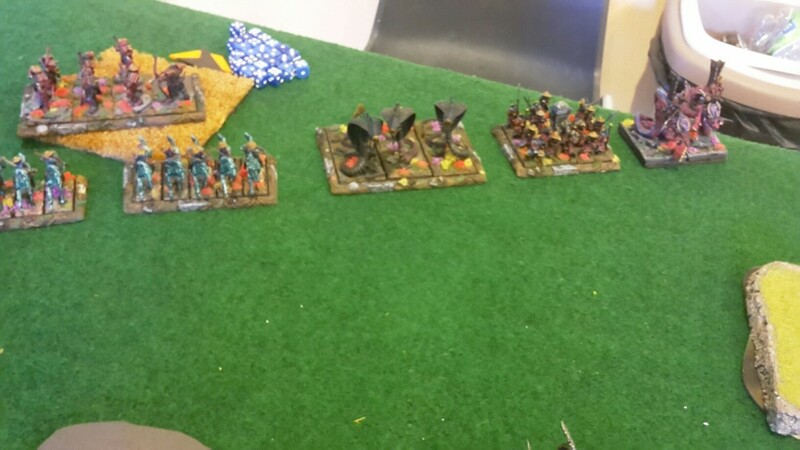 So a list with the usual suspects: double sphinx, double shabti archers, a big skeleton chariot block and a smattering of smaller units but thankfully no Sand Scorpions: With no entombed units to speak of, I only had to worry about what was right across of my army! 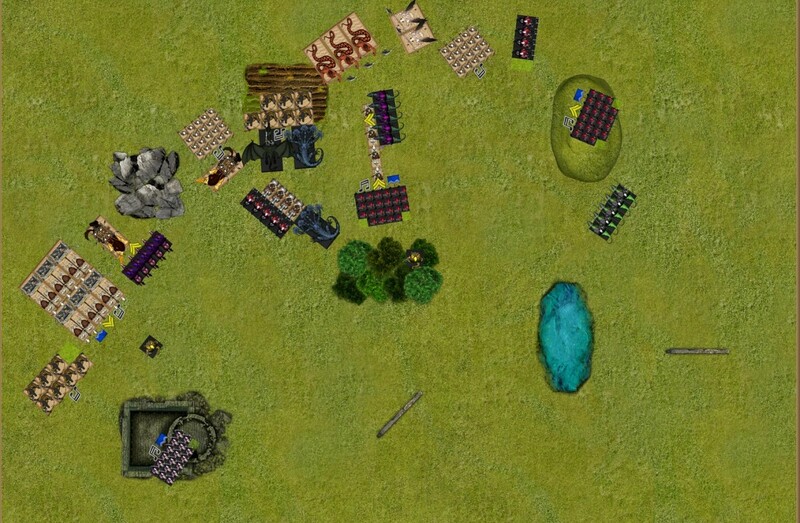 We got to play Flank Attack and Spoils of war, and after a couple of alternate drops I opted for a full deployment in order to get the advantage in the scenario: Spoils of War often depends on how well you can zone the enemy away from the spoils tokens, and whoever gets first turn usually has a big head start in that sub-game. For magic, I chose Breath of Corruption/Grave Calls and Ice and Fire/Crippling Fatigue, while the Hierarchs took Altered Sight/Perception of Strength and Know thy Enemy/Stars Align, for an augment-centered magic phase. With the certainty of getting first turn, I focused on building independent teams for each of the spoils of war tokens: the top right, a unit of Dread Legionnaires, along with the Dread Knights and a Medusa, squaring off against the Winged reapers and a unit of skeletons. On my left, the Dancers of Yema and the Yema Acolytes went for the spoils of war token in the ruins, opposite some shabti archers and the big chariot block. And, finally, in the middle the three monsters and a unit of legionnaires were preparing to take on the double sphinxes and the rest of the UD army. My adversary was at a disadvantage from the get-go here, since a big piece of impassable terrain was greatly limiting the sphinxes’ maneuverability. I tried to make the most out of it, by pushing my Dark Raiders in a single long file, blocking the entire UD battleline for a turn. 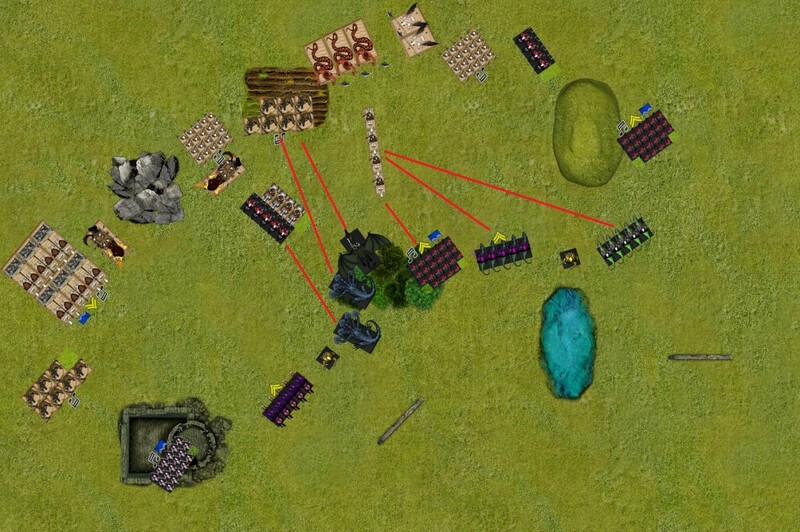 This allowed my scoring units and hard hitters to claim the no man’s land, threatening the UD advance with countercharges. To the top I was more reluctant to commit, since two unscathed Winged Reapers could do some serious damage on my Dread Legionnaires: in the magic phase I targeted the former with an Ice and Fire, managing an impressive four wounds on the unit, and gaining the upper hand in that partof the table. I also managed to debuff the same unit with Deceptive Glamour,making charging my Dread Legionnaires an even worse idea. My adversary retaliated by sending his fast cavalry into mine (rear and flankcharges respectively), a move that allowed him to shuffle the rest of his battle line into better positions. 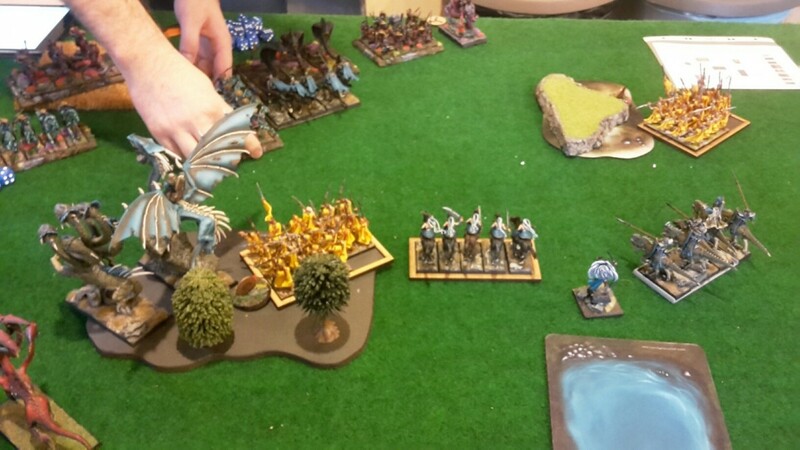 The Sphinxes moved on either side of the impassable terrain, the right one exposing its flank to protect the hierophant from a second turn dragon charge. The right shabtis advanced towards my dancers of yema, electing not to charge through the ruins on their own. Up top the now lone winged reaper retreated, leaving the spoils token unprotected. In the magic phase I had to let the Altered Sight off into the rightmost Shabtis, but in return I dispelled Perception of Strength on the charging horsemen and Stars align failed to cast. The ensuing shooting phase only managed a couple of wounds on the Dancers of Yema, the Krakens’ hide proving too tough for the Shabtis’ arrows. I saw the opportunity to get rid of multiple enemy threats in one go, provided that the charge/overruns worked out. 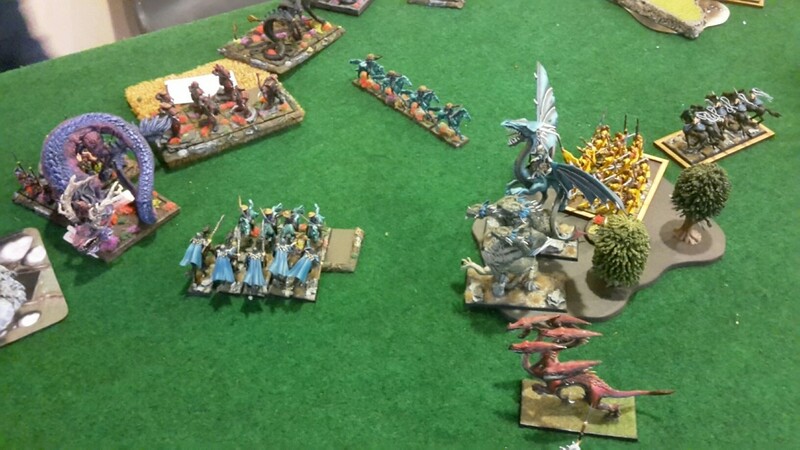 The way that the victorious undead horsemen were positioned, they were exposing their flank to a charge by the rightmost acolytes and the Dread Knights. Now, by also throwing the Dread Legionnaires into the mix, I would be making sure that even if one of the two cavalry units made it in, they’d be able to align in such away so as to get an overrun into the shabti archers’ flank. 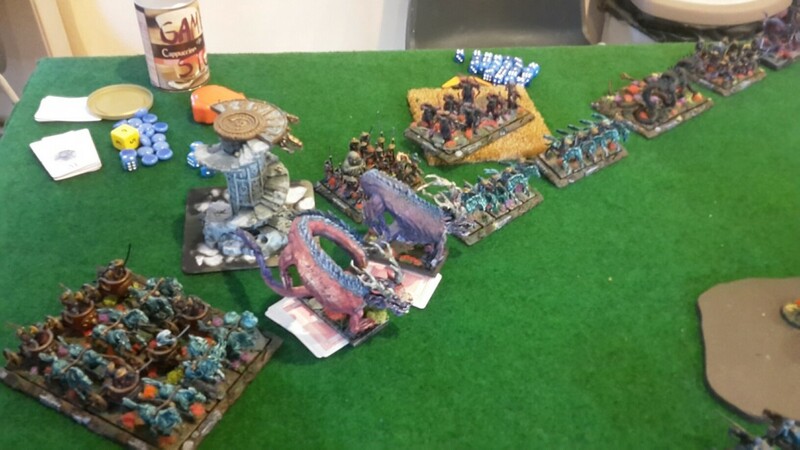 With that in mind, I declared both the rightmost Kraken and the Dragon into said shabtis; if this combat went my way, one of my two monsters would get now an overrun into the flank of the Tomb Stalkers. 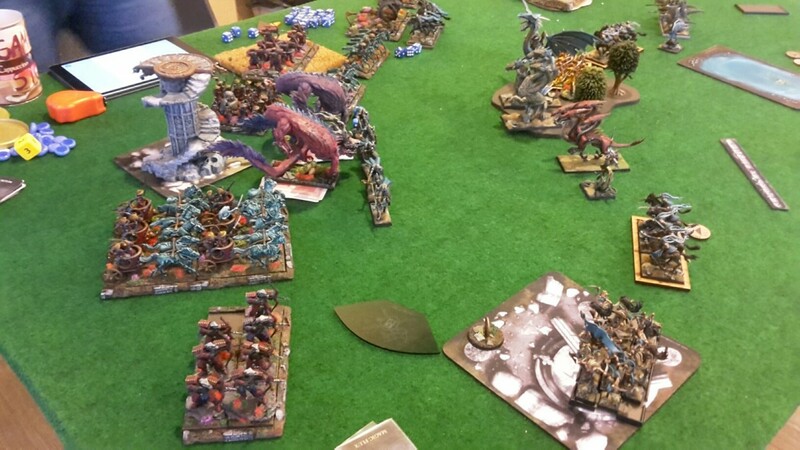 As a plus, the second kraken charged into the flankof the second unit of horsemen, still fighting the Dark Raiders: with the Dragon out of the way if the Shabti combat went my way, I’d be able to overrun into the flank of the Battle Sphinx! So I declared the charges in red, and made all of them except for the Dread Knights. To make sure that the UD forces on my left flank would not be able to support the right, I would have to sacrifice my Medusa, in front of the chariots,and my Yema Acolytes by throwing them in front of the second sphinx. 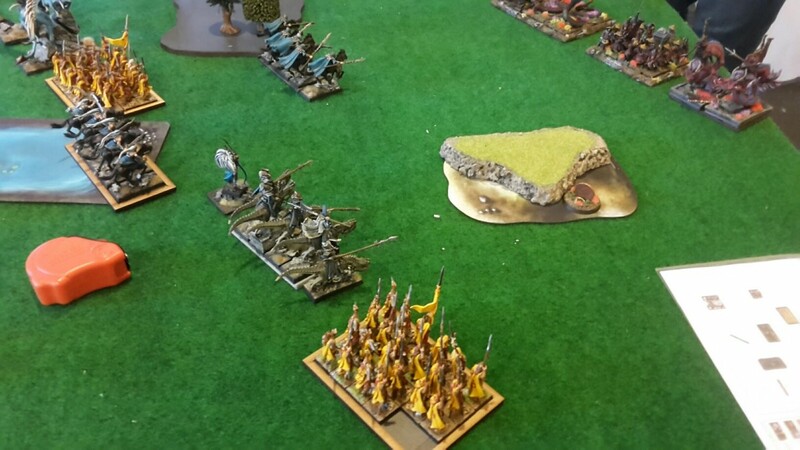 In the magic phase I focused all of my efforts into getting the Crippling Fatigue off on the shabti archers, and I managed to do so! As a plus, the Yema Acolytes were able to cast Breath of Corruption on themselves. In the ensuing combats, things went exactly according to plan: The acolytes and Legionnaires wiped out the undead horsemen, allowing the Acolytes to overrun into the shabtis’ flank. 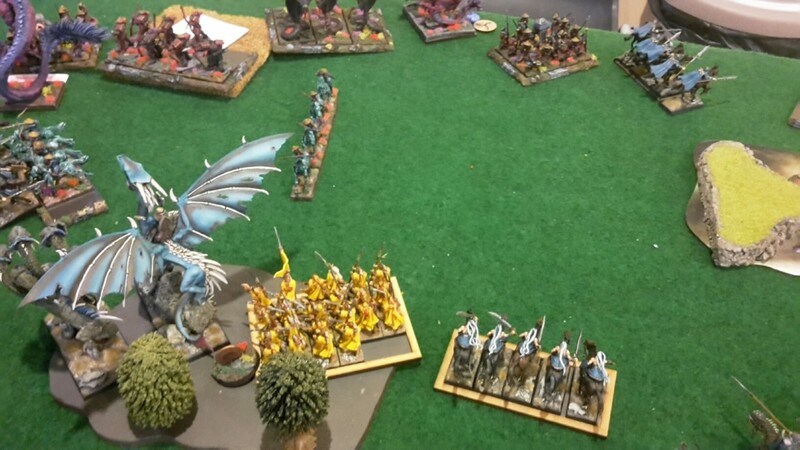 In that combat, the combined attacks of the kraken/acolytes/prince on dragon were enough to make the Shabti Archers crumble to dust, allowing yet another overrun, this time from the kraken into the Stalkers’ flank. With such a major setback on turn 2, my opponent tried to regroup: the left battlesphinx charged into the acolytes, while the chariots took the medusa redirector. The skeleton warriors to the right charged the dark raiders right in front of them, and they fled from the charge, out of the table. Finally, the Winged Reapers spotted the rear of my Acolytes and charged in. The remaining Shabtis still didn’t dare charge the Dancers of Yema, opting instead for moving towards them and shooting. The two Hierarchs went out of their unit, soon to be in combat with a very angry kraken. In magic, I let Know thy enemy unto the sphinx, and in return I dispelled Stars Align on the same. Shooting was yet again aimed at the dancers of yema, dropping another couple of elves. Combat was eventful, to say the least: the chariots killed the medusa with ease, but the Sphinx didn’t mirror their performance and only managed 3 wounds on the acolytes with all of its attacks and breath weapon: in return, a combination of the Acolytes’ poisoned attacks and the Toxic Breath weapon dropped the beast down to 2 wounds, then the dread elf elite held their ground. With one sphinx and the Winged Reapers pinned, and half of the enemy hard hitters gone, it was time for the killing blow: Both kraken fell upon the skeleton warriors, one with a clear overrun path into the Hierophant/Hierarch. 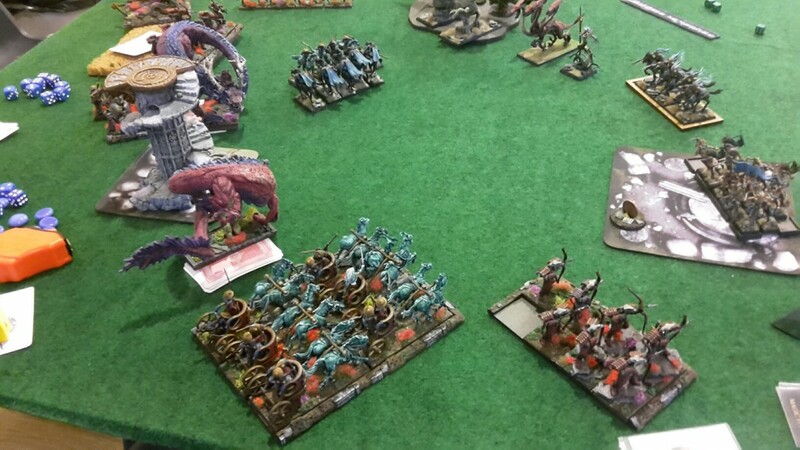 The Legionnaires to the right charged the skeletons right across of them. 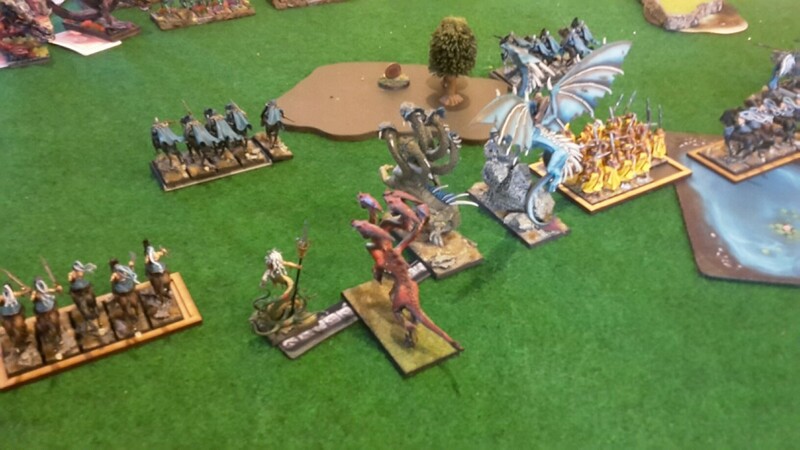 In remaining moves, the Dragon flew right behind the hierophant/hierarch mini-unit, in range for a breath weapon shot. The leftmost Dark Raiders jumped in front of the chariots to stall them for a further turn, and the Dancers of yema kept playing cat and mouse with the Shabti archers to the left. In magic Ionce again cast the Breath of Corruption on the yema acolytes, hoping to finish off the sphinx, and also managed a Deceptive Glamour on the Winged Reapers. The dragon used his breath weapon on the Hierarch duo, and managed to kill the hierophant and wound severely the second adept! In the resulting crumble sequence the remaining Battle Sphinx failed its Ld test and suffered the last two wounds,while the skeletons also crumbled a bit. In combat the Krakens wiped out the skeletons,and one overran into the remaining hierarch. The legionnaires dealt easily with the skeletons on the right side, and the Acolytes rolled exceptionally well and killed both winged reapers (a total of 5 wounds remaining!). The dancers avoided the shabti archers, who kept losing models to crumble but not nearly enough to give up victory points. 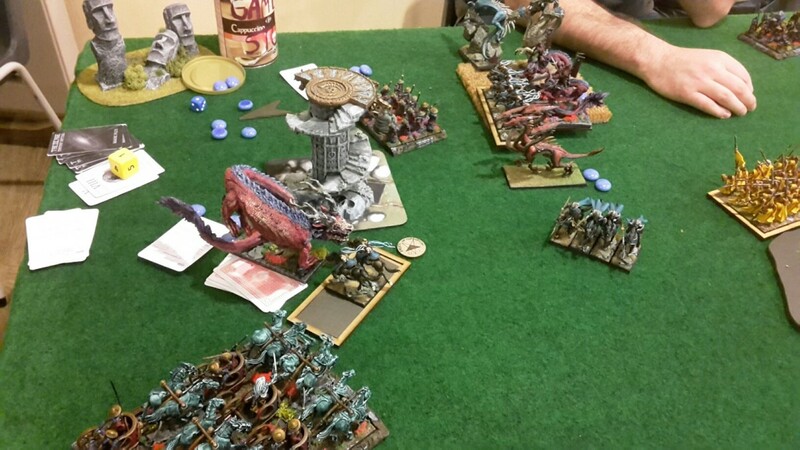 The Chariot unit got the Dark Raiders and thesecond medusa: being already up in points, I didn’t see the need to risk my dragon or the kraken to try and take the chariot block. 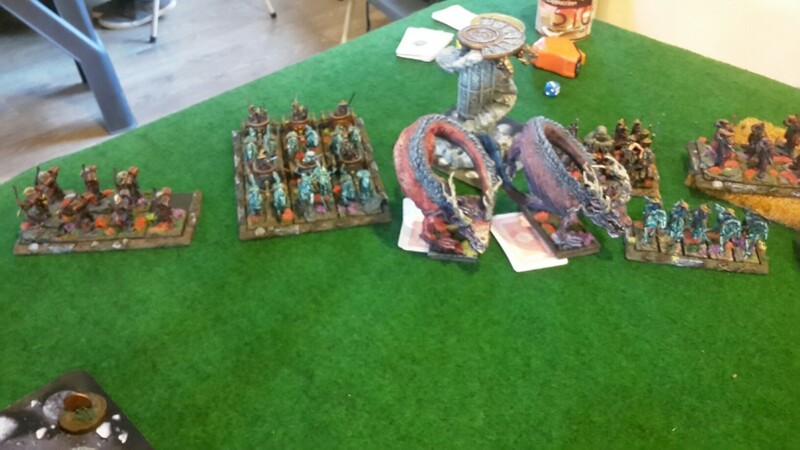 In the end, the game was a 19-1 victory for the Dread Elves! This proved to be a very one-sided game, for various reasons: First, my dice were pretty good all game long, in contrast to Yann’s dice that were very cold at crucial times. I managed to get a perfect combination on turn 2, which wouldn’t have worked as well if even one of the (admittedly, short) charges had failed. What’s more, getting first turn gave me a big advantage as far as the scenario was concerned, but also helped me pin down the battle line, with the big impassable terrain piece splitting the UD Army in two.The amount of expendable units available to me gave me the opportunity to keep part of the heavy hitters occupied, while my monsters and fast support were going to town on the other half of the undead army. Finally, there was definitely a list mismatch, in that the UD archetype that Yann is going for is not that different from what I’m trying to achieve with the DE: hard hitting monsters, good scoring and good zoning, sacrificing ranged/magic damage capabilities. However, I’ve found that Dread Elves excel in this playstyle whereas Undying Dynasties seem better suited for a reactive playstyle. In any case, it was a very fast paced and interesting game, and Yann was a perfect gentleman even when dice didn’t go his way! I owe him a rematch sometime soon, we decided to make it best out of three to settle the grudge once and for all. So with 3 wins by the end of the tournament, out of which two rather big ones, I ended up with 52/60 Tournament points: this was enough to guarantee me the third place in Belgium’s biggest T9A tournament to date, a result I was very happy with! Ahead of me you could find none other than @PrinceCharming with his “weak” ogres, and @valmir with his Vermin Swarm that handed me my backside in a friendly game a while back. Congratulations to both for a great, and deserved, result! Overall, Tower Conquest was acknowledged by all the participants as the best T9A event we’ve ever had in Belgium: smoothly run,in a great location (a medieval tower), a great crowd of players, very good organization, good prize support, and some of the best food one can hope for in a tournament. So a big thanks to @Sire Trencavel and co for running it! I won’t go into detail with list discussion, as this is what the list discussion thread is for! Also, with the new version out, it would be more productive to discuss lists for the new rules. 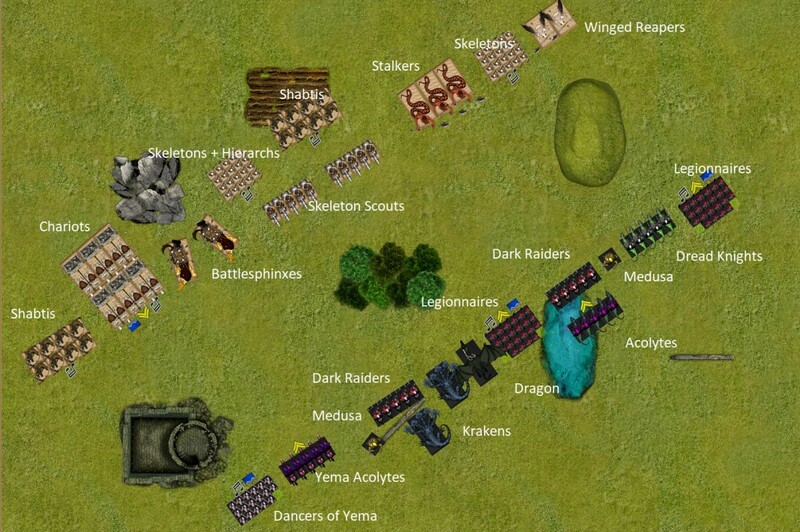 In short, the list works as intended: it enables an aggressive playstyle that I really enjoy, and allows me to bring some very cool units/models to the table. Against the right opposition, it can be very effective, and still gives you the tools to get out of difficult situations in an unfavorable matchup. But this doesn’t conclude my v2.04 Dread Elf adventures: in a couple of days’ time I’ll be attending the final tournament for 2018, which happens to be a team tournament right next to my house! 48 people will be gathering for Brussels Mercenaries Team Tournament, organized in 12 teams of 4 players. I’m sure that this is going to be a blast, and I’ll take enough pictures to tell you all about it! I hope you enjoyed this report series! I love your reports. Keep doing it, please. Looking forward to meeting you in a game (I would like to appear in your battle reports). Are you playing next ESC or ETC in Novi Sad? .. and they are LOUD! !